Managers at the Nonprofit Association of Oregon have embarked on a year-long effort to train staff on a new workplace ethic that is transforming how nonprofits operate. Staff are learning about the concept of equity and inclusion and how it applies to their own organization and the way they conduct business. As a partner on our annual 100 Best Nonprofits to Work for in Oregon survey, the Nonprofit Association of Oregon has recommended we include questions about equity and inclusion to reflect their growing importance in the sector. Workplace practices and customs continually evolve, and our surveys should evolve to reflect new sociopolitical, economic and cultural trends. Given that the concept of equity and inclusion has gained momentum in the nonprofit world, we are incorporating some of the association’s recommendations in the next survey, which launches April 18. The notion of equity and inclusion started to gain momentum a few years ago after socio-political events, such as the Black Lives Matter movement, started a national discourse on the continued marginalization and discrimination of racial minorities in the U.S. In the nonprofit sector, and also to a lesser extent in the private sector, the conversation has shifted from how to provide equal opportunities in the workplace to how to create an equitable workforce. The change comes from the recognition that to create equality for all employees, historically marginalized groups may need extra help or resources to be on an equal footing with dominant groups. Nonprofit funders have led the charge in promoting the concept of equity and inclusion. Some well-known charitable foundations, such as the Meyer Memorial Trust, have started to prioritize grants to nonprofits that can prove they practice equity in their day-to-day operations. Establishing equity in the workplace cuts across all areas, including work environment, management and communications, and benefits and compensation. A few examples of equity in the workplace include the creation of a culture where all diverse groups have a voice in decision-making. To create open communication, managers need to recognize some groups communicate differently to other groups for cultural reasons, and may need extra resources to communicate those ideas. Another example is how organizations provide holidays. An equitable approach allows employees flexibility in paid holidays rather than forcing workers to take off days for holidays they don't celebrate. 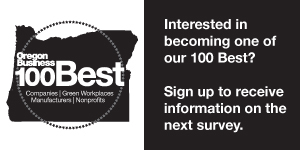 By incorporating ideas of equity into the employee and employer benefits sections of our 100 Best Nonprofits to Work for in Oregon survey, we hope the project stays up-to-date with this new workplace trend. We also hope the survey will be an opportunity for employers to see how satisfied their staff are with this new concept. Hopefully it will spark a conversation within organizations about their approach.